My Momma has a version of Shoe Peg Corn Salad that is very very different from mine. Hers has mayonnaise in it - not my favorite ingredient. One day I'll have to share her recipe too so you can make a judgement as to whether you prefer mayo or yogurt/sour cream. A great many dishes have been made this week due to The Great Freezer Clean Out with my version of Shoe Peg Corn Salad being one of them. The salad would be equally great at barbecue or a dinner party. It makes a wonderful accompaniment to heavier Tex-Mex type foods like enchiladas or quesadillas. 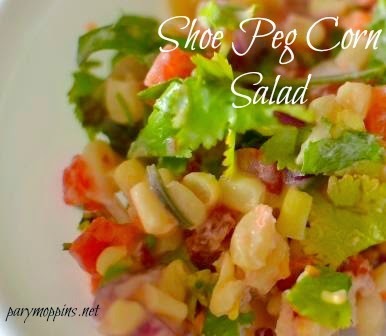 Shoe Peg Corn Salad tastes better the next day but you can eat it right away. This is so quick and easy to make that it's almost a crime to call it a recipe. This is part of FPT, SYitG & WFMW. We need to have a great freezer clean out very soon since we've had no power for 3 days! This recipe looks delish! Oh dear Ms. Talya! So sorry to hear that. Nothing like a freezer move or a power outage though to spur on a clean-out. 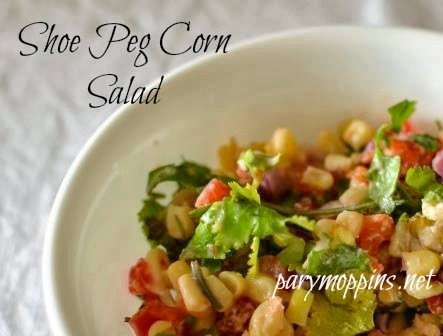 I just love this recipe for Shoe Peg Corn Salad, awesome! Hope you are having a great week and thanks so much for sharing with Full Plate Thursday! I'll have to try your yogurt/sour cream version. Mayo isn't really my favorite thing either! Great idea to serve for a cookout. Thank you for sharing!